Lightroom Classic Tutorials > Workspace > Oooops, how do I undo? It happens to all of us… you move the wrong slider, sync settings across too many photos, or the cat walks over the keyboard and all of your hard work disappears. Your beautifully edited photo ends up looking completely different and they all end up with the wrong star ratings. Oooops! But don’t panic, there are a few options to undo your mistake, so let’s walk through them one by one. If the mistake has only just happened, the first port of call is the Undo command. That’s Ctrl-Z on Windows or Cmd-Z on Mac. When pressed repeatedly, it steps back through your recent actions, whether that’s slider movements, metadata changes, or simply switching between modules. If you go too far, press Ctrl-Y (Windows) / Cmd-Shift-Z (Mac) to redo the last action. There are a few actions that can’t be undone using these shortcuts, such as deleting photos from the hard drive, but the dialogs always warn if an action is not undoable using this shortcut. 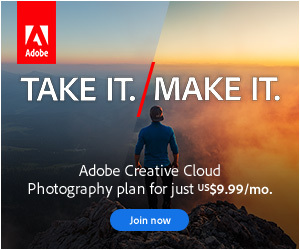 But what if you come back to a photo some time later and discover you synchronized Develop settings across the wrong photos, or applied some other incorrect Develop settings? 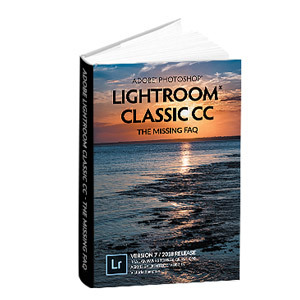 Undo won’t help if you’ve restarted Lightroom, but the History panel can. 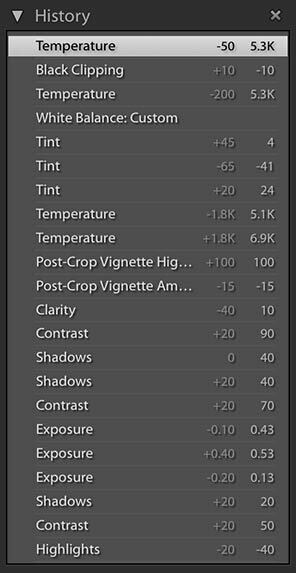 Lightroom keeps a record of all the Develop changes made to each photo. You can see this list in the History panel on the left in the Develop module. To go back to an earlier version, click on an earlier history state in the History panel. If you make further changes, a new history is written from that point on, replacing the steps that followed. If you’ve made a massive blunder, perhaps syncing settings over a large number of photos or removing photos from your catalog, it can be quicker to restore from backups. If your backup is recent, it’s easiest to simply restore the entire backup catalog, however if you just want to restore metadata and edits for specific photos, it is possible to restore only part of the backup catalog… more on that next week. I try to remember to create snapshots at intervals which makes it relatively easy to undo multiple changes in one step. Unfortunately my memory isn’t as it used to be or maybe I’m so concentrating that I forget. That’s a good idea Philip. Thank you thank you Because of you I can go to bed and and not cry all night. Thank you Victoria, you just saved my little world. I thought LR was playing up so I restarted it, only then realising I was accidentally sync-editing a hundred images that I had just spent hours on, and had now just lost any ability to Ctrl-Z. You just introduced me to the history panel and now I have to take back a lot of expletives I directed at LR. I’m now happily going through each one and resetting it to ‘last export’. Phew. Phew indeed! I’m glad that helped. Thanks Victoria. I’m just starting out and am very happy to learn about the Ctrl -Z button! Hi, I renamed a sub-folder and then synced the parent folder and lost all my edits in that sub-folder. Is there a way to “un-sync” or get back my edits? I’m afraid I’ve just lost A LOT of time and mental stability….AHHHH!